Easily label cell lines for tracking cell fate after implantation in an animal model or other imaging applications with SBI’s line of Bioluminescent, Fluorescent, and PET Imaging Vectors (BLIV). 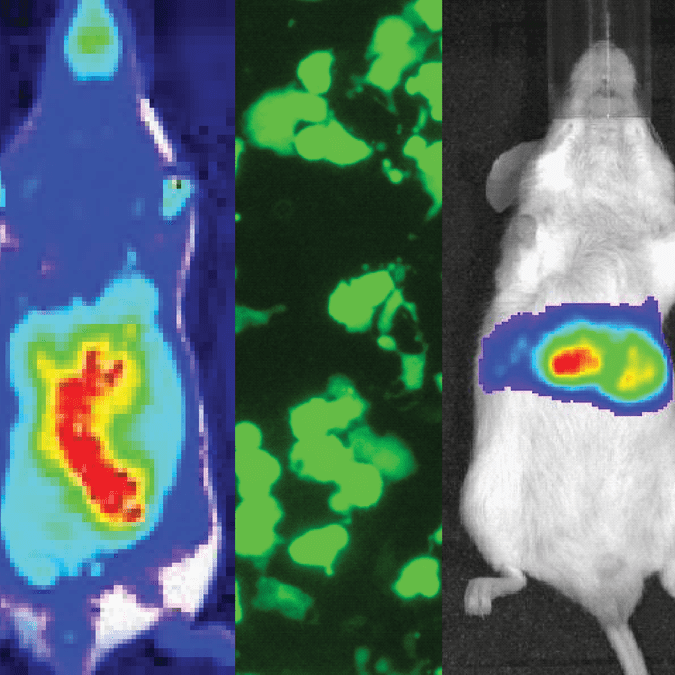 Available in a variety of promoter-reporter combinations that enable multiple imaging modalities—fluorescence with copGFP, bioluminescence with luciferase, and positron emission tomography (PET) with thymidine kinase (TK)—you can select from lentivector or minicircle technologies for both integrated and episomal expression. The EF1α-Luciferase Minicircle for In Vivo Imaging leverages SBI’s easy-to-use Minicircle Technology to deliver luciferase to target cells. The reporter is expressed from an EF1α promoter for medium expression in most cell types including primary and stem cells. The EF1α-Luciferase Minicircle is available as both parental plasmid and ready-to-transfect minicircle DNA*. Which BLIV construct should you choose? *Note that Minicircle Parental Vectors are only available to academic/non-profit customers. Researchers at commercial organization may only purchase the pre-made minicircle BLIVs. Figure 1. Examples of how SBI’s BLIV lentivectors deliver strong luciferase activity after both transduction and transfection. Figure 2. Examples of how SBI’s BLIV minicircle vectors deliver strong luciferase activity in small animal models. Figure 3. Examples of how SBI’s BLIV lentivectors and minicircle vectors can be used to generate stable cell lines with strong luciferase activity.